Analysis: Utes respond well after falling behind Weber State 10-0 in season opener, and now it gets tougher. 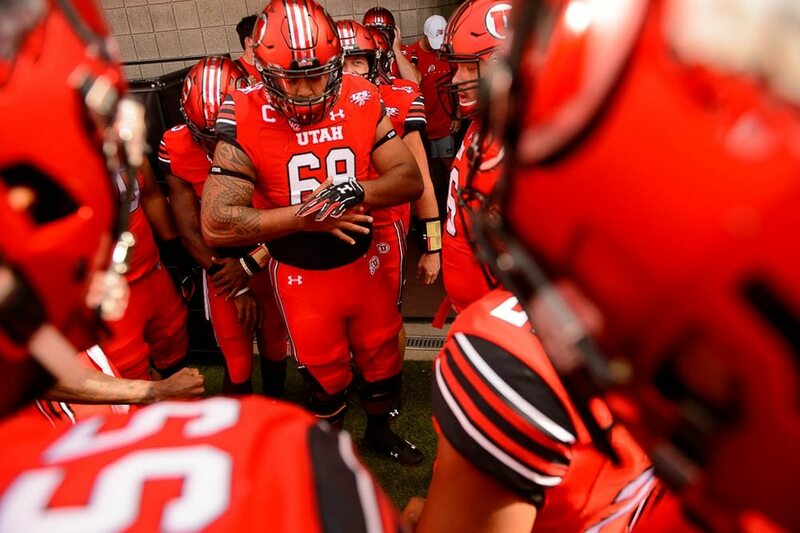 (Trent Nelson | The Salt Lake Tribune) Utah Utes offensive lineman Lo Falemaka (69) leads the team in the huddle before the game as the University of Utah Utes host the Weber State Wildcats, Thursday Aug. 30, 2018 at Rice-Eccles Stadium in Salt Lake City. (Trent Nelson | The Salt Lake Tribune) Utah Utes offensive lineman Lo Falemaka (69) leads the team in the huddle before the game as the University of Utah Utes host the Weber State Wildcats, Thursday Aug. 30, 2018 at Rice-Eccles Stadium in Salt Lake City. 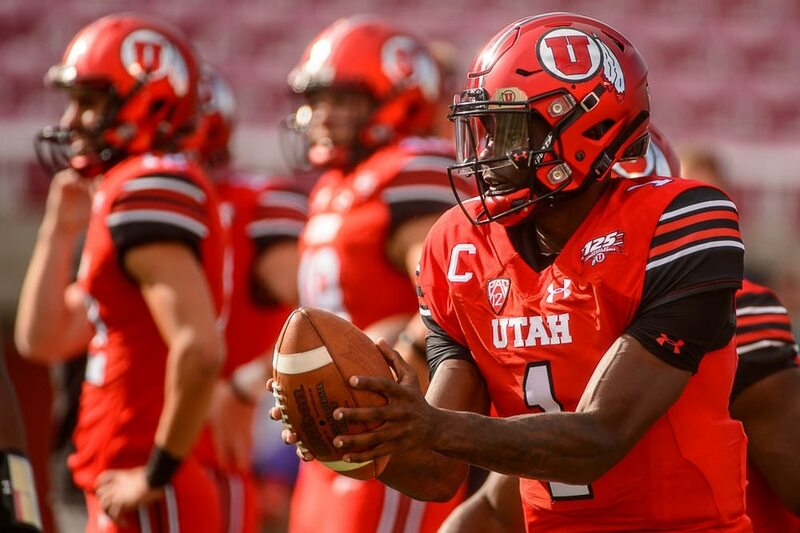 (Trent Nelson | The Salt Lake Tribune) Utah Utes quarterback Tyler Huntley (1) warms up as the University of Utah Utes host the Weber State Wildcats, Thursday Aug. 30, 2018 at Rice-Eccles Stadium in Salt Lake City. (Trent Nelson | The Salt Lake Tribune) The University of Utah Utes host the Weber State Wildcats, Thursday Aug. 30, 2018 at Rice-Eccles Stadium in Salt Lake City. (Trent Nelson | The Salt Lake Tribune) Weber State Wildcats wide receiver David Ames (83) and Utah Utes defensive back Julian Blackmon (23) as the University of Utah Utes host the Weber State Wildcats, Thursday Aug. 30, 2018 at Rice-Eccles Stadium in Salt Lake City. (Trent Nelson | The Salt Lake Tribune) Utah Utes defensive back Marquise Blair (13) grabs a ball stripped from Weber State Wildcats running back Treshawn Garrett (6) as the University of Utah Utes host the Weber State Wildcats, Thursday Aug. 30, 2018 at Rice-Eccles Stadium in Salt Lake City. The ball was ruled dead before the turnover. (Trent Nelson | The Salt Lake Tribune) Utah Utes defensive back Marquise Blair (13) brings down Weber State Wildcats quarterback Kaden Jenks (11) as the University of Utah Utes host the Weber State Wildcats, Thursday Aug. 30, 2018 at Rice-Eccles Stadium in Salt Lake City. (Trent Nelson | The Salt Lake Tribune) Weber players celebrate a turnover as the University of Utah Utes host the Weber State Wildcats, Thursday Aug. 30, 2018 at Rice-Eccles Stadium in Salt Lake City. (Trent Nelson | The Salt Lake Tribune) Weber State Wildcats quarterback Kaden Jenks (11) passes as the University of Utah Utes host the Weber State Wildcats, Thursday Aug. 30, 2018 at Rice-Eccles Stadium in Salt Lake City. (Trent Nelson | The Salt Lake Tribune) Utah Utes running back Zack Moss (2) as the University of Utah Utes host the Weber State Wildcats, Thursday Aug. 30, 2018 at Rice-Eccles Stadium in Salt Lake City. (Trent Nelson | The Salt Lake Tribune) Utah Utes defensive back Philip Afia (2) as the University of Utah Utes host the Weber State Wildcats, Thursday Aug. 30, 2018 at Rice-Eccles Stadium in Salt Lake City. (Trent Nelson | The Salt Lake Tribune) Utah Utes running back Zack Moss (2) as the University of Utah Utes host the Weber State Wildcats, Thursday Aug. 30, 2018 at Rice-Eccles Stadium in Salt Lake City. (Trent Nelson | The Salt Lake Tribune) Weber State Wildcats wide receiver Devon Cooley (85) loses the ball as the University of Utah Utes host the Weber State Wildcats, Thursday Aug. 30, 2018 at Rice-Eccles Stadium in Salt Lake City. At right is Utah Utes defensive back Corrion Ballard (15). (Trent Nelson | The Salt Lake Tribune) Utah Utes quarterback Tyler Huntley (1) as the University of Utah Utes host the Weber State Wildcats, Thursday Aug. 30, 2018 at Rice-Eccles Stadium in Salt Lake City. (Trent Nelson | The Salt Lake Tribune) Utah Utes quarterback Tyler Huntley (1) as the University of Utah Utes host the Weber State Wildcats, Thursday Aug. 30, 2018 at Rice-Eccles Stadium in Salt Lake City. (Trent Nelson | The Salt Lake Tribune) Utah Utes defensive back Marquise Blair (13) and Utah Utes linebacker Chase Hansen (22) celebrate a turnover as the University of Utah Utes host the Weber State Wildcats, Thursday Aug. 30, 2018 at Rice-Eccles Stadium in Salt Lake City. (Trent Nelson | The Salt Lake Tribune) Weber State Wildcats quarterback Kaden Jenks (11) passes the ball as the University of Utah Utes host the Weber State Wildcats, Thursday Aug. 30, 2018 at Rice-Eccles Stadium in Salt Lake City. (Trent Nelson | The Salt Lake Tribune) Utah defenders swarm on Weber State Wildcats running back Treshawn Garrett (6), who loses the ball as the University of Utah Utes host the Weber State Wildcats, Thursday Aug. 30, 2018 at Rice-Eccles Stadium in Salt Lake City. (Trent Nelson | The Salt Lake Tribune) Utah Utes defensive back Jaylon Johnson (1) as the University of Utah Utes host the Weber State Wildcats, Thursday Aug. 30, 2018 at Rice-Eccles Stadium in Salt Lake City. (Trent Nelson | The Salt Lake Tribune) Utah Utes running back Zack Moss (2) is stopped just short of the end zone by Weber State Wildcats safety Jawian Harrison Jr. (2) as the University of Utah Utes host the Weber State Wildcats, Thursday Aug. 30, 2018 at Rice-Eccles Stadium in Salt Lake City. (Trent Nelson | The Salt Lake Tribune) Utah Utes running back Zack Moss (2) runs between Weber State Wildcats safety Jawian Harrison Jr. (2) and Weber State Wildcats cornerback Keilan Benjamin (10) as the University of Utah Utes host the Weber State Wildcats, Thursday Aug. 30, 2018 at Rice-Eccles Stadium in Salt Lake City. (Trent Nelson | The Salt Lake Tribune) Utah Utes wide receiver Britain Covey (18) makes a long, crazy run as the University of Utah Utes host the Weber State Wildcats, Thursday Aug. 30, 2018 at Rice-Eccles Stadium in Salt Lake City. (Trent Nelson | The Salt Lake Tribune) Utah Utes wide receiver Siaosi Mariner (8) scores a touchdown as the University of Utah Utes host the Weber State Wildcats, Thursday Aug. 30, 2018 at Rice-Eccles Stadium in Salt Lake City. (Trent Nelson | The Salt Lake Tribune) Weber State Wildcats quarterback Kaden Jenks (11) passes as Utah Utes defensive end Bradlee Anae (6) closes in, as the University of Utah Utes host the Weber State Wildcats, Thursday Aug. 30, 2018 at Rice-Eccles Stadium in Salt Lake City. (Trent Nelson | The Salt Lake Tribune) Utah Utes running back Zack Moss (2) scores a touchdown as the University of Utah Utes host the Weber State Wildcats, Thursday Aug. 30, 2018 at Rice-Eccles Stadium in Salt Lake City. (Trent Nelson | The Salt Lake Tribune) Weber State Wildcats tight end Justin Malone (88) as the University of Utah Utes host the Weber State Wildcats, Thursday Aug. 30, 2018 at Rice-Eccles Stadium in Salt Lake City. (Trent Nelson | The Salt Lake Tribune) Utah Utes running back Zack Moss (2) scores a touchdown as the University of Utah Utes host the Weber State Wildcats, Thursday Aug. 30, 2018 at Rice-Eccles Stadium in Salt Lake City. (Trent Nelson | The Salt Lake Tribune) Utah Utes tight end Jake Jackson (44) and Utah Utes tight end Cole Fotheringham (89) celebrate a first half touchdown as the University of Utah Utes host the Weber State Wildcats, Thursday Aug. 30, 2018 at Rice-Eccles Stadium in Salt Lake City. (Trent Nelson | The Salt Lake Tribune) The University of Utah Utes host the Weber State Wildcats, Thursday Aug. 30, 2018 at Rice-Eccles Stadium in Salt Lake City. (Trent Nelson | The Salt Lake Tribune) The University of Utah Utes host the Weber State Wildcats, Thursday Aug. 30, 2018 at Rice-Eccles Stadium in Salt Lake City. (Trent Nelson | The Salt Lake Tribune) Utah Utes tight end Brant Kuithe (80) celebrates a touchdown as the University of Utah Utes host the Weber State Wildcats, Thursday Aug. 30, 2018 at Rice-Eccles Stadium in Salt Lake City. (Trent Nelson | The Salt Lake Tribune) Utah Utes tight end Brant Kuithe (80) scores a touchdown as the University of Utah Utes host the Weber State Wildcats, Thursday Aug. 30, 2018 at Rice-Eccles Stadium in Salt Lake City. (Trent Nelson | The Salt Lake Tribune) Utah Utes wide receiver Solomon Enis (21) defended by Weber State Wildcats cornerback Parker Preator (20) as the University of Utah Utes host the Weber State Wildcats, Thursday Aug. 30, 2018 at Rice-Eccles Stadium in Salt Lake City. (Trent Nelson | The Salt Lake Tribune) Utah Utes quarterback Tyler Huntley (1) as the University of Utah Utes host the Weber State Wildcats, Thursday Aug. 30, 2018 at Rice-Eccles Stadium in Salt Lake City. (Trent Nelson | The Salt Lake Tribune) Kyle Whittingham as the University of Utah Utes host the Weber State Wildcats, Thursday Aug. 30, 2018 at Rice-Eccles Stadium in Salt Lake City. Top-tier college quarterbacks Jake Browning of Washington, Khalil Tate of Arizona and Justin Herbert of Oregon will face Utah’s defense later this season. Kaden Jenks of Weber State will remain on the list of visiting QBs who started games at Rice-Eccles Stadium in 2018, but he’s not in the same league as those other guys. Jenks beat out two former Boise State quarterbacks to earn his first start as a redshirt freshman in the Wildcats' 41-10 loss Thursday. He ran for a 2-yard touchdown that gave Weber State a 10-0 lead in the first quarter, but that’s where his highlights ended. Jenks completed 5 of 22 passes for 13 yards, numbers that will validate Utah’s secondary as the best in school history and among the premier groups in the country — for one week, anyway. His first completion went for 6 yards; the other four connections netted 7 yards, while Jenks was sacked three times for losses of 3 yards. Add it up, and the Wildcats gained 10 yards on 25 designed passing plays. The Utes didn’t intercept any passes (or recover a fumble) and Weber State turned two takeaways into 10 points in the game’s first 10 minutes. Otherwise, Utah’s defensive effort was historic, holding the Wildcats to 61 total yards in the debut of WSU offensive coordinator Dave Schramm, who once called Utah’s plays. Defensive end Bradlee Anae (via his pass rushing), cornerback Julian Blackmon and safety Marquise Blair each was credited with two passes defended. Blair’s impact came in his first game since injuring his knee in early November. After the Utes' season opener vs. an FCS opponent, ESPN's Football Power Index ranks their remaining strength of schedule No. 3, behind Florida State's and UCLA's. The FPI projects the Utes for 6.8 wins, down slightly from earlier this week, as they prepare for next Saturday's game at Northern Illinois. After that, the Utes may face the country's toughest schedule over their last 10 games. “Obviously, the degree of difficulty goes up,” Whittingham said. • Utah’s offense needs work. The statistics look good, with 294 rushing yards and 293 passing yards, but the linemen and receivers were inconsistent and the offense lacked much rhythm for big chunks of the game. Quarterback Tyler Huntley was sacked only once and ended up passing for 253 yards and four touchdowns, but had to scramble frequently. And while Zack Moss totaled 150 yards on 16 carries, eight of his runs went for 2 yards or fewer. • Chase Hansen looks like a linebacker. His move from safety is a further endorsement of Utah’s secondary, and Hansen is “in his element” at linebacker, Whittingham said. Weber State ran only 53 offensive plays, so none of Utah’s defensive players recorded big numbers of tackles, but Hansen made two tackles for loss in the first half. • This happens every year. Utah has won 11 openers in a row, but recent games have been unsatisfying because of the offense’s slow starts. 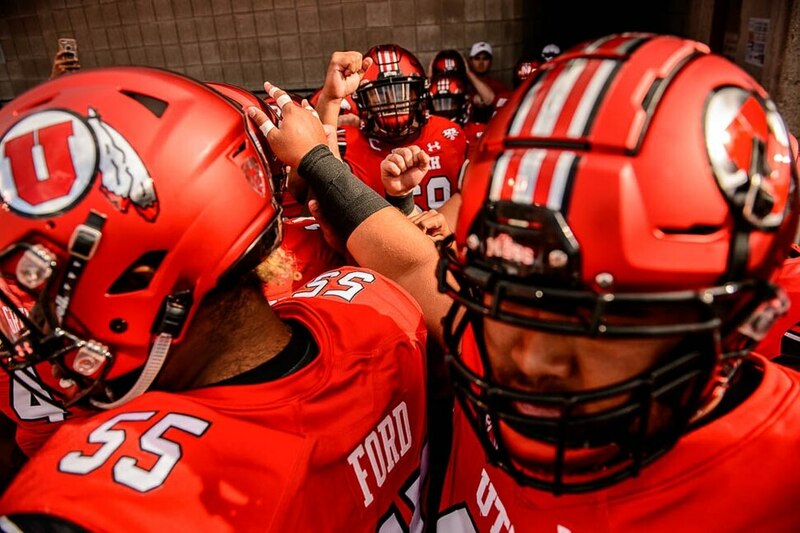 In 2016, the Utes led Southern Utah 17-0 in the fourth quarter before winning 24-0. Last August, they led North Dakota 17-9 at halftime of a 37-16 win. Thursday’s halftime score was 17-10. John Penisini, defensive tackle. Pita Tonga started ahead of him, but Penisini played a lot in the line’s rotation. The junior from West Jordan High School and Snow College made three tackles for loss on running plays, including two in a row in the first half. Receiver Britain Covey’s 38-yard run in the third quarter. On a designed pass play, the former Timpview High School quarterback avoided a loss and weaved across the field. Covey’s run led to Utah’s first touchdown of the second half for a 24-10 lead. Runner-up: Redshirt freshman quarterback Jason Shelley’s 40-yard run on a zone-read keeper in the fourth quarter, which followed a 40-yard completion to Jaylen Dixon (his former high school teammate in Texas) on his first pass in college. Shelley and running back Devin Brumfield botched a handoff (the fumble was charged to Brumfield in the play-by-play account), but Shelley otherwise justified his selection over freshman Jack Tuttle as the backup to Tyler Huntley. Former BYU linebacker Francis Bernard, listed as the backup to Hansen at rover, made his first appearance for Utah and recorded an assisted tackle. Northern Illinois, Utah’s next opponent, opens the season at Iowa (1:30 p.m. MDT) on the Big Ten Network. No. 6 Washington, which visits Rice-Eccles Stadium on Sept. 15, meets No. 9 Auburn in Atlanta, also at 1:30 p.m. on ABC. 1950 • Utah 46, Utah State 0; the Aggies post 42 yards and two first downs. 1953 • Utah 21, Idaho 0. The Vandals record 58 yards and three first downs. 2018 • Utah 41, Weber State 10. The Wildcats finish with 61 yards and three first downs, including 15 yards on their last possession.